For Dry Type Transformers:- As layer insulation for coils. In Traction Motors:- As insulation for conductor bundles. Polycom’s PREPREGS are made by coating/impregnating flexible materials (Nomex®, Non-woven or Fabric) with ‘B’ stage reactive coating of resin. Depending on backing material used; Prepregs belong to insulation class ‘E’ & ‘F’. Prepregs are tack - free at room temperature but become tacky at 110°c to 130°c. These are converted to ‘C’ stage by heat energy & pressure to achieve good bonding between the copper conductor. The resin system depends on processing conditions of the customer, but usually epoxy resin is used. Highly flexible in supplied condition. Good bonding capability due to the re-active stage of coating. Excellent winding & trouble-free machining qualities. Enhanced mechanical and dielectric strength. Quality norms are top priority at polycom associates to ensure customer's delite with both product quality & services. Regular on line checks & control of tensile strength, elongation, B.D.V, & bond strength contribute to consisting of quality. 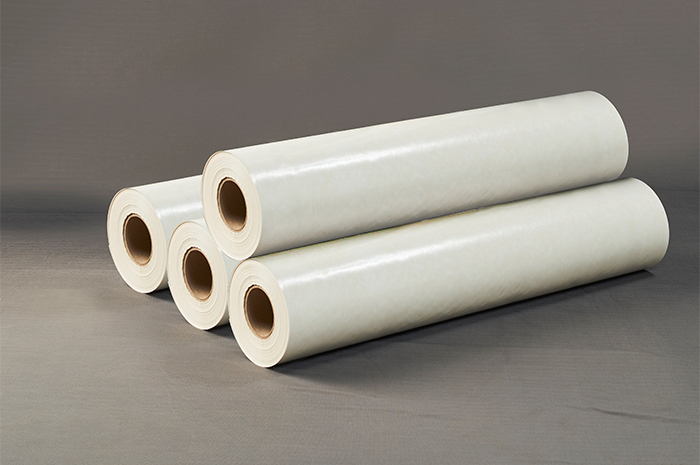 Prepregs are available in rolls of 910 mm width & in narrow width of 10 mm onwards (multiples of 5mm). Prepregs are to be stored in cool & dry area at a temperature of less than 20°c and are to be used within 6 months. Sunrays & thermal radiation is to be avoided.